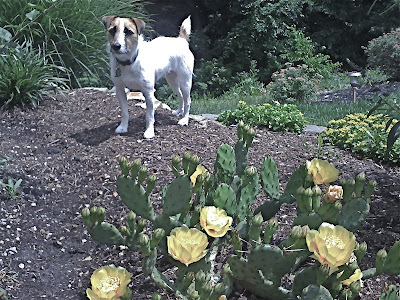 When I heard a few years ago that the Eastern prickly pear is native to Ohio, I had to get one. 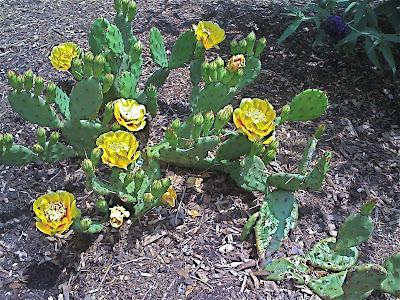 Opuntia humifusa's range is from Massachusetts to Minnesota and Ontario to Florida and Oklahoma. At CadMur Manor in Mill Creek, its lemon-yellow flowers started popping a few days ago. Each flower doesn't last much more than 24 hours -- and only that long if Sheba doesn't devour the delicious blooms first. We couldn't stop her from feasting on the flowers last year, but so far at least this year she's left them alone. Maybe she got the point. These cactuses, not surprisingly, like dry, sandy or rocky soil and full sun. Get one for your back yard for something different. As well, Pam made a qualitative argument for the beauty of a practice that was necessary if not fashionable in the days of our grandparents. A trip to Amish country earlier in the day had its stunning effect, she said. Sheets, shirts and shorts among other washables waved wonderfully in the warm breeze, a beautiful mosaic. If Pam came looking for a fight, she might be disappointed. Nodding heads greeted her every word. I don't know how these things work, if every homeowner has to vote at an upcoming meeting or if the board will just take a vote and notify people of their decision. With luck residents of this urban enclave will be able to mimic the Amish at least in one small way. Not a bad step. 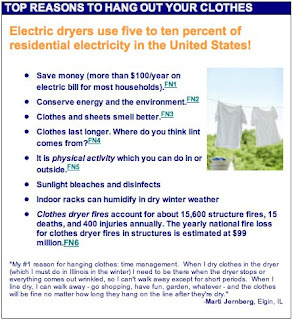 There's a movement promoting the "right to dry." It's called Project Laundry List. Check the website.